The Table Bluff Community Garden has gotten off to a great start this year. We began the planting season with an amazing garden party that got the ball rolling. Many different organizations brought donations to help our garden along. Among them were the United Indian Health Services Potawot Community Food Garden, Redwood Community Action Agency, University of California Cooperative Extension, Humboldt State University’s Social Services Department, and Earthly Edibles Farm. Without their kind donations it would have been difficult to purchase all the seeds and plant starts we now have growing. Also in attendance were some of the tribe’s youth who got an opportunity to apply their green thumbs. Much thanks to all who participated and brought donations. With the year quickly winding down the first harvests have begun to take place. Thus far we have already harvested over sixty-seven heads of lettuce, several heads of broccoli, a few heads of cauliflower, several zucchini and summer squash with a total weight of seventeen pounds, over six pounds of snap peas, and a variety of others including tomatoes, strawberries, swiss chard, and kale with much more to come. The corn, potatoes, pole beans, and onions are nearing completion and will be harvested sometime over the next month. Once harvested they will be divided equally then disbursed to community members, with emphasis on elders and those with special dietary needs. The rest will be used at the Wiyot Day feast, which I hope to see many of you at, on Saturday September 8 from noon til dusk at 1000 Wiyot Drive in Loleta. Also worth mentioning, we recently received a small garden grant that will pay for a dozen apple trees and some blackberry starts that will begin a community orchard and berry patch. Thank you to the Redwood Community Action Agency for that opportunity. Lastly, I would like to invite you to come and visit the community garden and get your hands dirty any time you like. To get ahold of me to arrange a visit call me at the tribal office, (707) 733-5055, ext. 106. Submitted by Vincent DiMarzo, Environmental Technician for the Wiyot Tribe. St. Joseph Health received CalFresh grant funds through Humboldt County's Department of Health and Human Services to support local efforts around community gardens. The grant will pay for a Master Gardener to provide gardening events and classes at 4 community garden locations: Rio Dell, Loleta, Willow Creek, and Blue Lake. A total of 40 hours has been budgeted for this contract work. In addition to hiring a Master Gardener for support of the above mentioned community gardens, there are funds to hire a local gardener to support families/individual with their individual plots for a total of 100 hours. This position will assist community gardeners with the maintenance of their plot (pulling weeds, planting starts, providing general guidance, etc.) Contact Maureen Lawlor at (707) 672-5957 to learn more about these exciting opportunities to get involved in our local efforts to address food security here on the North Coast. The Humboldt Chapter Community Alliance with Family Farmers (CAFF) is excited to announce that September 2012 is Local Food Month, a county-wide celebration of local food, local producers, and local abundance. Local Food Month encourages people to produce, process, and consume foods within a geographic locale. Doing so reduces the amount of energy, or fossil fuels, needed to transport food. Our current food system relies heavily on fossil fuels to both produce and transport food to all corners of the globe. Fossil fuels are a limited resource, and depending on them for access to our food makes our current food system unsustainable. Additionally, rising oil costs mean higer food prices, as we’ve experienced in recent years. Higher prices make some healthier foods beyond many people's budgets. You can support a more accessible, localized, and sustainable food system by choosing to eat locally grown and processed foods. 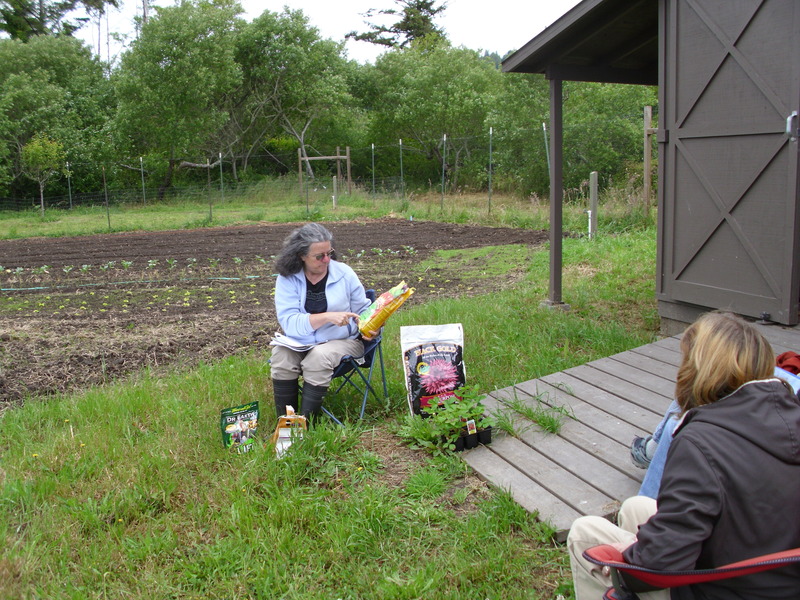 Local food is abundant in Humboldt County. You can find it at farmers’ markets and in grocery stores. You can also grow a large variety of foods here. The mild coastal climate is conducive to gardening year round in some areas. Community gardens offer a place for people without land to grow their own food and herbs, and are a critical component of a more localized food system. They help give people more choices for affordable, healthy, and local foods—especially now that seeds and starts can be purchased with CalFresh (formerly food stamps). And, when people can choose their own variety of crops to grow, they can grow crops that are not available in local markets—for example, vegetables that are part of their cultural or culinary background, or flowers and herbs from their culture's medicinal heritage. Throughout September, a series of events provide opportunities to enjoy and learn more about local foods. A full calendar of events is available at www.caff.org/humboldt. Though the days are getting shorter and fall is in the air, it is not too late to plant a fall/winter garden. As warm-weather crops die off and go to seed, now is a good time to collect, dry, and save seeds for next year. Dry seeds well and store away from moisture to increase their viability. Start prepping your fall/winter garden by weeding out old annual plants, and trimming back perennials. Depending on whether you live inland or on the coast, your options will differ. Many gardeners inland plant a cover crop over winter months, to add nutrients and organic matter into the soil. Good choices include fava or bell beans, ryes, vetches, and clovers, or some mixture thereof. Plant soon while soils and days are still warm. Make sure to till under in March or April, when rains subside briefly and the ground thaws, to ensure decomposition occurs before spring planting. For gardeners living near the coast, there are many crops which may be grown year-round. After weeding you may want to amend the soil with compost or aged manure before planting. Root crops like beets, turnips, radishes, and carrots do well in the cooler seasons and should be planted as soon as possible. Other hardy plants include brassicas like cabbage, broccoli, and cauliflower; peas; and greens like chard, kale, spinach, and lettuces. At this point in the season, it is best to plant these from starts versus seeds, to give the plants time to get established before the colder rainy season begins. In the next couple months, plant onions and garlic in the ground for a harvest next year. Once the garden is up and running, weeds and pests will be your biggest enemy. The need for water will diminish as the rainy season returns. Unfortunately, weeds are as thirsty as the plants you’re trying to grow. Be persistent in removing them, especially as your plants are getting established in their new garden home. Pests like slugs and snails are abundant in the rainy weather, and need constant removal to ensure plants, especially young ones, do not get munched. If you have extra space, please consider planting excess food to donate to food pantries, or family and friends in need. Food For People in Humboldt County has 16 satellite sites around the county, and can be reached at (707) 445-3166. In Del Norte, the Community Assistance Network is one organization which distributes garden food. Contact (707) 464-9190 for more information. Happy Fall Gardening! - Saturday September 8: Wiyot Day Celebration. Noon til dusk at Wiyot Tribal Headquarters, 1000 Wiyot Drive in Loleta. Come check out the Table Bluff Community Garden, enjoy traditional dances, a community potluck and salmon BBQ, ceremonies honoring Elders, and more! For more information please call (707) 733-5055. - Sunday September 9: Redwood Roots Farm Open House. From 1pm to 4pm in Bayside on Jacoby Creek Road. Kids activities at 2pm, and farmers available to answer questions. For more information please visit redwoodrootsfarm.com. - Tuesday September 11: CalFresh Training. 1:30pm to 3:30pm at 507 F St in Eureka. Intended for organizations, this workshop will educate those who assist people with applying for Calfresh. For more information or to register, please call (707) 268-2172. - Saturday September 15: Canning Workshop through UC-Cooperative Extension. From 10am to 4pm at UCCE Agriculture Center in South Eureka. $30 fee. To sign up or for more information please call (707) 445-7351. - Wenesday September 19: “Pints for Non-Profits” benefits Food For People. From 4pm to 11pm at the Redwood Curtain Brewery, 550 South G Street #6 in Arcata. $1 of every pint sold is donated to Humboldt County’s food bank. For more information please call (707) 445-3166. - Wednesday September 19: Master Food Preserver Demonstration on Green Bean Freezing, Canning and Pickling. From 6pm to 7pm at the Eureka Co-op on 4th and B Streets. For more information visit northcoastco-op.com or call (707) 443-6027 ext 102. - Saturday September 22: Food Drive at Arcata Farmer’s Market. From 9am to 2pm at the Arcata Plaza. Support local farmers and help those in need by purchasing extra produce for a food drive benefitting Food For People, Humboldt County’s food bank. For more information please call (707) 445-3166. Eligible shoppers have an opportunity to double their dollars when they use their CalFresh card at farmers’ markets in Humboldt County. Most farmers markets now welcome CalFresh, formerly known as food stamps, allowing more people to buy fresh and local produce. The Fortuna and Garberville farmers’ markets not only welcome Calfresh, they encourage it! Until the end of September, the Fortuna and Garberville Farmers’ Market will offer Market Match, or incentive dollars, of up to $10, for customers using their CalFresh cards. Many other farmers’ markets in Humboldt County are also offering similar Market Match programs to CalFresh shoppers. Customers can walk up to market manager’s tables and present their CalFresh card which will be swiped and shoppers will be given tokens in return to purchase fresh, local, seasonal items. The Community Alliance with Family Farmers (CAFF) received funds from the Humboldt Department of Health and Human Services to help the Fortuna and Southern Humboldt farmers’ markets offer their incentive programs. The programs help increase access to healthy foods as well as support local farms. The Fortuna Farmers’ Market is open every Tuesday from 3 pm to 6 pm on 10th and L Streets. Southern Humboldt’s Garberville Farmers’ Market is located on the Town Square on Church Street, Fridays from 11 am to 3 pm. Visit redwoodag.org for a complete schedule of Humboldt County farmers markets and take advantage of the season’s best. For more information on Calfresh or to see if you qualify call Department of Health and Human Services at 1-800-891-8551. Gardening Gazette is a free publication of the North Coast Community Garden Collaborative, a support network of and for community gardens and partners working to increase access to fresh, healthy, and culturally appropriate foods for all North Coast residents. There are many ways you can support community gardens, like donating time, expertise, money, or gardening supplies such as tools or amendments. For more information about the Collaborative please visit northcoastgardens.org or contact Debbie at DebbieP@nrsrcaa.org. We are always looking for article ideas and events related to gardening and food to advertise in Gardening Gazette. If you have ideas or events you'd like to see published, please contact Debbie at DebbieP@nrsrcaa.org.